The man accused of murdering Hugo Chetcuti had been at the hotel lobby earlier in the afternoon on that fateful day, and had been cold and detached when greeted by the manager. This was one of the key facts which emerged during the hearing during compilation of evidence against Bojan Cmelik. During the last hearing, Magistrate Marse Ann Farrugia had to stop the sitting after Mr Chetcuti's brother-in-law Noel Falzon lunged at Mr Cmelik, before being restrained by court security and dragged out of the courtroom. The prosecution declares that it has no more witnesses. The case has been adjourned to December 12. The police officer, Karl Dimech, admits that they had no radios and mobiles with them and that he eventually stopped a passerby and asked to use her mobile phone so that he could call his sergeant, who was at the time in a car. The car collected him and they set off - but the chase was called off when they received news that the suspect had been caught and was being taken to the police station. He explained that the suspect’s clothes - which had blood on them - were removed to preserve evidence. 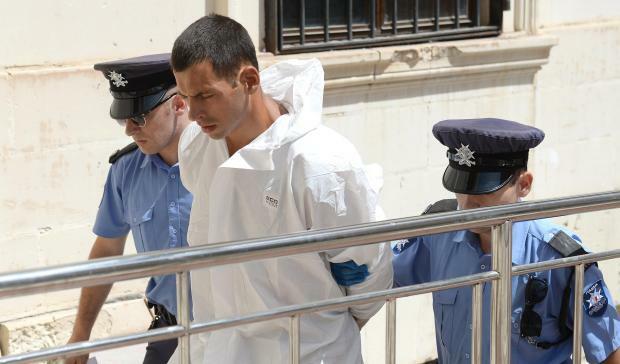 The suspect was taken to the Floriana health centre to be examined by a doctor, who noted several bruises, and then summoned to Mater Dei by the court expert. An ex-police officer is on the stand now. The information he is giving deals with the chase, and so far has not added anything to what we already knew. However, his testimony added a sense of what the chase was like. He was the one who identified Mr Cmelik in Sliema, and had shouted out to him: "Stop, police! We want to talk to you!". The accused ignored him and ran off, however, with the police in hot pursuit. The witness said that he had called out to him, ordering him to stop several times, all in vain. At one point, he stumbled on the uneven rocks and by the time he got up to the promenade, the Serbian had disappeared, heading in the direction of The Point. Cmelik being escorted to court. You could feel the tension go up a few notches when the next witness took the stand: Hugo’s brother-in-law Noel Falzon, the man who had caused the uproar in last sitting. At the time that the hearing was called off, he was being questioned by lawyer Joe Giglio, who has now taken up where he left off. Mr Falzon manages five outlets and, for seven months in 2017, Mr Cmelik was employed at one of them, Bacco’s. He had started off as a bar helper but gradually worked his way up to serving customers but Mr Falzon said his attitude had been a problem, giving a few examples. Mr Cmelik took his wages and left and that was the last that Mr Falzon saw of him. As Mr Falzon leaves the stand, Dr Giglio politely but firmly asks him to leave the room. Mr Cmelik was fired from his job as a bar helper at Hugo’s Terrace because he failed to show up for work on New year’s Eve. The former operations manager at the terrace Dylon Mallia said that he had been the one to decide to fire him and that he was also the one who had communicated this to the Serbian. The manager of Hugo’s boutique hotel saw the accused in the lobby the afternoon of the murder, easily recognisable because of his unusual hat. Caroline Barbara said she was there early as a World Cup match was being shown later and they were getting everything ready. At the moment of the murder, she was on Mr Chetcuti’s right hand side and saw a tall man hugging him and running away. She recalled how Mr Chetcuti had raised up his shirt, looking shocked, showing his wound and saying he had been stabbed. It was only at that point that she remembered having seen the accused before. She had been struck by how cold and detached he had been in the lobby when she greeted him: he looked her in the eye as if to say: "What are you looking at?" She also pointed out that the lobby has a CCTV camera which could provide useful footage. No surprise after what happened in the last hearing: the court has ordering that - in the public interest - only lawyers and media are to be allowed in, together with two relatives of accused and two relatives of the deceased. Last month, things had become quite heated when Mr Chetcuti's brother-in-law Noel Falzon objected to what he felt was a smirk on the face of the accused and the whole session had to be called off. Lawyer Joe Giglio, appearing parte civile on behalf of the Chetcuti family, said he had also noticed. The magistrate gave Mr Cmelik a stern telling off. But with an angry Mr Falzon still fuming outside, she was forced to pospone the sitting to November 7. In spite of the decree, security is the tightest it has been so far, with some 12 officers around the room and outside. And in spite of the limit on who can be in there, the hearing is being heard in a larger room, one normally used for jury trials. Magistrate Magistrate Marse Ann Farrugia had last July already determined that there were sufficient grounds for Bojan Cmelik to face trial. However, the trial will only start once the compilation has been concluded and the bill of indictment is issued. Three pieces of information which have emerged from previous sittings are listed below. Click the links to find out more. Mr Cmelik was apprehended after an hour-long chase on the night of the stabbing, and had to be tasered three times before he stopped resisting arrest. A knife was tucked into his waistband. DNA of three separate people was found on the murder weapon, a knife: Mr Cmelik's, Mr Chetcuti's, and a third person's. 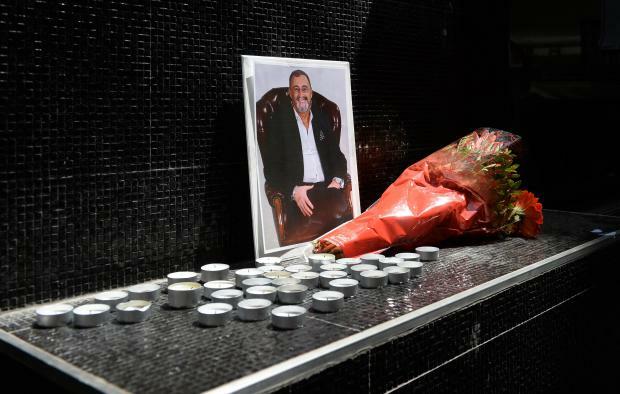 Mr Chetcuti died on July 12, six days after he was stabbed in Paceville by a former employee on a busy Friday night outside one of his own establishments. The attack was witnessed by several individuals and what caught on CCTV.